You probably didn't see this coming — it's a new, different kind of awareness-raising challenge, and the brainchild of journalist Ayman al Aloul. The "Rubble Bucket Challenge" draws attention to the bombing in Gaza over the course of Israel's Operation Protective Edge, a conflict which has lasted — with a few broken ceasefires along the way — seven weeks. Aloul, himself a Palestinian, felt moved to "send a message all over the world about Gaza," as he told NBC News. And to do so, he's tapping into the exercise of the Ice Bucket Challenge — dumping a bucket over your head, though a blast of ice water sounds way easier than being doused with rubble and dirt. There are a few different names floating around to track the effort on social media. It's also being called the Dust Bucket Challenge, or as Aloul's video debuting the concept calls it, the Remains Bucket Challenge. The concept's origins are pretty clear to see; videos and images of bombed-out buildings and streets of Gaza have gone worldwide over the past two months. To complete the challenge, get a bucket full of dirt, dust or what have you, and pour it over your head. Unlike the Ice Bucket Challenge, there's no overt call to donate money if you're unwilling to take it. In short, it's a symbolic gesture aimed at highlighting the plight of Gaza citizens. And it's not solely limited to the Middle East, either, as people from around the world (like this fellow in Canada, for example) have gotten in on the act. As explained in Aloul's own videoed challenge, he has a modest goal in mind as far as getting public figures involved. If five famous people in the world like actors or presidents will do the challenge, that means I succeeded in sending the message about Gaza. Since the start of these most recent hostilities between Israel and Gaza, there's been a contentious dynamic playing out in terms of the two sides' exposure and media criticism, with countless pro-Palestinian voices pushing to have their side of the story represented. Proponents of Israel, meanwhile, have focused attention on condemnation of Hamas and the danger its aggressions puts Palestinian civilians in; the ongoing state of rocket fire from Gaza into Israel; and the presence of so-called "terror tunnels" running from under the besieged city into Israeli territory. Conversely, those trying to tell the Palestinian side of the story have a devastated landscape to point to. 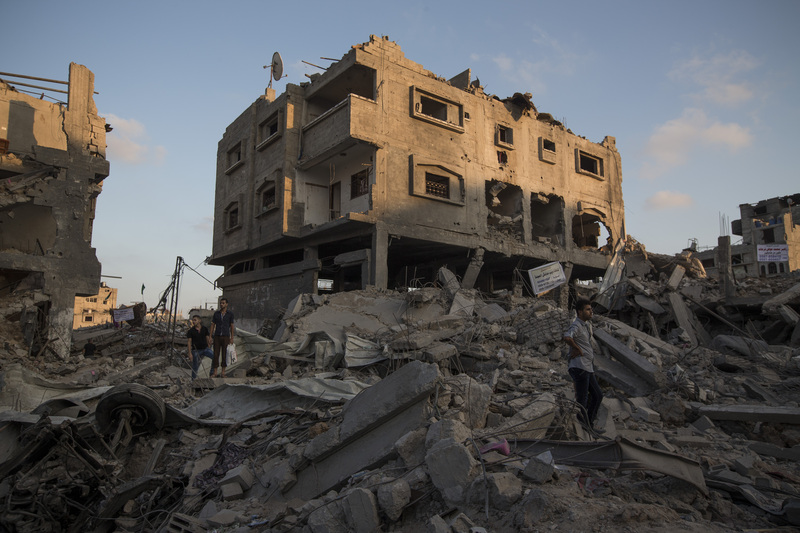 Regardless of where you stand on the conflict, Protective Edge has leveled a ton of buildings in Gaza, and has killed a lot of people — over 1,900 dead, with three-quarters considered civilian deaths, according to the United Nations. The toll on the children of Gaza, in particular, has been a much-discussed and hard-to-stomach element of the conflict — hundreds of children have been killed, according to the United Nations. Basically, the Rubble Bucket Challenge attempts to tap into those scenes of destruction in a personally affecting, and somewhat grimy way — urging people to drench themselves in the sort of dirt and dust that Gaza's now full of, amid knocked-over buildings and houses. So far, it's gotten a fair amount of attention, with people uploading videos and images of their rubble-dumps to social media. Of course, there's an undeniable risk of appropriation, here — this young social media movement is derivative of its better known, icy ALS-combating original. Seeing as the Rubble Bucket version will stir more political division than the battle against a neurodegenerative disease will, it's possible — actually, pretty unavoidable — that this challenge will polarize a lot of people. That said, independent of your perspective, it's a creative and striking representation of the struggle so many residents of Gaza have been living under in recent weeks. And if you're a supporter of their cause, it's one way to show solidarity.